Mandalas like the one being created here are beautiful, intricate patterns painstakingly drawn with colored sand. Buddhist monks from Drepung Monastery’s Gomang College, formerly of Tibet and now re-established in India, will visit Dickinson for a five-day residency beginning Tuesday, Nov. 17. 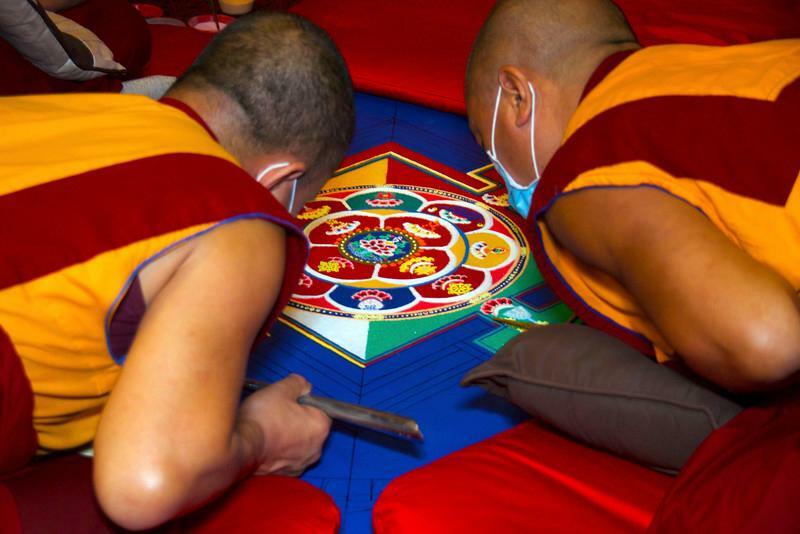 The monks will construct a mandala out of colored sand; perform a puja and cultural program with traditional Tibetan dances, chanting and debating; and visit classes. The purpose of these cultural displays is to spread a message of peace, foster interfaith dialogue and maintain the endangered Tibetan culture. The Drepung Monastery was established in 1416 by Tsongkhapa, the founder of the Gelukpa sect of Tibetan Buddhism. The Gomang dratsang, or college, is the oldest of the four colleges of Drepung. Each college has its specialty, and the focus of Gomang is in philosophy, logic and debate. The college has a proud history of many great Tibetan scholars and theologians. Dan Cozort, associate professor of religion, will provide a contextual background and understanding of the ensuing Buddhist ritual activities. Following his talk, the monks will perform a puja, which is a ritual involving chanting and visualization of the symbolized cosmos. Wednesday, Nov. 18, 10 a.m. This ceremony will be followed by a “Green Tara Mandala Construction” from 11 a.m. to 4:30 p.m. Construction of the mandala will continue on Thursday, Nov. 19, and Friday, Nov. 20, from 9 a.m. to 4:30 p.m., and on Saturday, Nov. 21, from 9 to 11 a.m. Mandalas are beautiful, intricate patterns painstakingly drawn with colored sand. Over a four-day period, the Buddhist monks will create a symbol of the entire cosmos with the Buddha of Enlightened Activity—Tara, in her green form—at its center. Onlookers can observe the monks and converse with them around the mandala platform. Wednesday, Nov. 18, 7 p.m. The monks will display colorful traditional arts including a variety of dances, such as the yak, snow lion and “good luck” dances. Saturday, Nov. 21, 11 a.m.
During this ceremony, which will officially end the Tibetan Buddhist monks’ residency at Dickinson, the Green Tara Mandala will be swept away, signifying the impermanence and brevity of life. Those in attendance will have the chance to take home some of the colored sand from the former mandala. These programs are sponsored by the Clarke Forum for Contemporary Issues and co-sponsored by the Center for Sustainability Education; the departments of East Asian studies and religion; the Center for Service, Spirituality and Social Justice; the Waidner-Spahr Library; and the Division of Student Life. For more information, call 717-245-1875.